about $9,000 in his long-running case against the France 2 station. 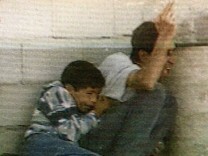 Enderlin on the killing of 12-year-old Mohammed al-Dura in Gaza in 2000 was doctored. Philippe Karsenty presented his point of view just prior to the ruling in the June 22nd Jerusalem Post Article “Thanks to Kuperwasser al-Dura report, truth is on its way“. Once again an injustice is done in the al-Dura case. The French High Court in overturning an appeals court ruling has convicted and fined Phillipe Karsenty of defaming France2 News. In denying his right to access all of the original footage in order to prove his case, the effect is that a news organization is permitted to film a ‘performance’, present it as news and any parties harmed by such will have no legal recourse to exam all original footage to prove the lie. Today’s news organization: Is its purpose to INFORM the public or is it to FORM public opinion? The answer is no longer obvious. This ruling seems to say that there is no defined ethical public responsibility to publish the facts and truths insofar as they can be known. The ‘freedom of the press’ appears to be an unlimited ‘freedom to defame’, including use of their influence to color a news report with their own ideology, to hide, create, or distort the facts and even insinuate bold lies into the story. This can be done quite easily today by altering photos, creative video editing, or changing a word or two in a quotation. Unfortunately, for many publishers, editors, and reporters, their ‘for-the-greater-good’ end justifies any means. They intend to conform the world to their own view of paradise regardless of immediate and lasting injury to any party – individual, national or international. 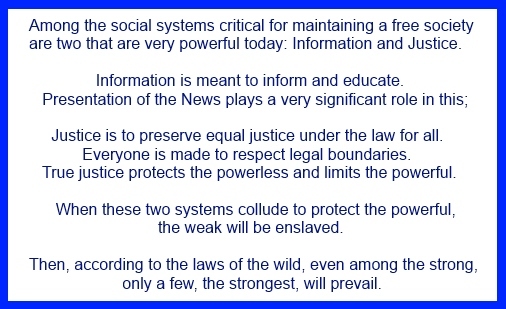 By abusing the power of the TV screen, the front page headlines and news blogs, they accomplish two things: 1) intended – they convince the naive and uninformed; 2) unintended – they lose the trust of those who seek the truth. 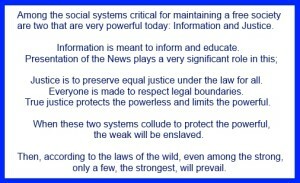 The need to close off other avenues of knowledge to the 2nd group may one day be used to justify government control of the news in countries where it is currently ‘free’. Are they so blind? Do they not see that by abusing the right given them to find and print truth, that very ‘right’ may be lost, subject to the whim of those who hold power: Heads of State, Parliaments and Justice Systems? Israeli Doctor who was exonorated in France after proving Mohammed al-Dura’s father lied about his injuries, explains what happened to Mohammed as-Dura and Rami al-Dura and why the time line didn’t make sense. Summary: Mohammed was already dead and Rami (crouching with his father) wasn’t killed by anyone. See link for full story. Finally, an official Israeli report on the ‘ al-Dura incident’ has been published, although it has come so late that lasting harm has been done. Everyone has apparently decided what s/he believes. No further information, barring a live ‘boy/young man’ or new hard evidence of death, its cause and identification of the body will change any minds. In my opinion and according to this report, this was a “Pallywood” production with the local and French press as willing accomplices. The Palestinians’ “Pallywood” staff work hard to present Israel to the world as a terrorist nation who murders women and children. The intended audience, by and large, is still inclined to believe newspaper and magazine reports, photos and, even more so, on-line video clips ‘from the front lines’. Some western journalists have been warned not to work with Arabic speaking reporters who fail to toe the “All- Occupation, All The Time” reporting. This is how the PA controls not only their own media outlets, but those western outlets. All too many simply play along rather than stand up for press and speech freedoms and possibly risk losing access. Editors should know that whenever the primary reporter and those who file reports ‘from the field’ are locally hired journalists, their stories should be thoroughly checked. However, over and over again, we see that they either have not verified the reports or have allowed the reports through written with an anti-Israel bais which distorts the facts. And what about the news organizations and the crews themselves? Do the news crews have no moral or ethical values, or perhaps is there loyalty to their rulers override all honesty. There are exceptions, but they are few and are likely to pay a high price. Is this what we have come to with our fabulous technological ability to report the news from any corner of the world? We’ve seen other staging of a news reports before this one but with much less impact. For instance, during the war in Lebanon Reuters was forced to admit that their photos were photo-shopped to present false battles and deaths. It’s also reported that the foreign press has submitted complaints from time to time against the IDF for not permitting them free access when there is rioting. 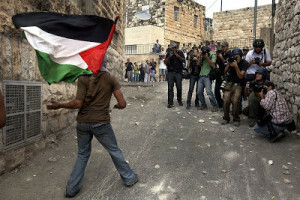 The IDF, on the other hand, claims that news crews sometimes, purposely or not, incite the rioters. With the record we have seen, is it any wonder that the IDF is not anxious to permit foreign journalists and local reps of foreign agencies to enter the field with them? In any case, they are likely to find many of them among and behind the rioters. One Response to French Justice? Media Distortion? This is a very good story. In the U.S. out of date pictures and twists of the truth are presented as fact causing a division of the people. No longer are we a United States.